De verborgen eigenschappen van water. Er is een boel controverse rondom de werking van de homeopatische middelen. Alhoewel elke dag heel veel mensen in Nederland ervaren wat een heilzaam effect homeopathie kan hebben op mensen, is het werkingsmechanisme soms onderwerp van discussie. Vooral de verdunningen in water worden vaak geridiculiseerd door de reguliere artsen. Recentelijk is er echter een groot homeopathisch congres geweest welke op wetenschappelijk niveau de eigenschappen van water heeft gekoppeld aan de werking van de homeopatische middelen. Het artikel is Engelstalig, maar wel heel verhelderend. Meer weten? Neem u contact met mij op (link). To be on the edge of scientific enquiry is to investigate the frontiers of knowledge. Homeopathy is a field of endeavour that certainly lies on that edge. The conventional biochemical action of drugs doesn’t explain how homeopathic remedies work. One common view is that remedy actions are implausible, and they seem to be nothing more than water. New and exciting developments on the frontiers of physics and materials science are shining light into the plausibility of homeopathy. Plausible homeopathy exists. Research about nanoparticles and the properties of water confronts the claims against the homeopathic tradition, that remedies are nothing more than placebo agents, sugar pills or empty water. Many interesting papers were presented at the 11th Australian Homoeopathic Medicine Conference, October 2018 in Manly, NSW Australia. (AHMC18). Two presentations addressed this topic directly, one by Dr. Alex Tournier and another by Dr. E.S Rajendran. Dr. Alex Tournier presented a paper “Is Homeopathy that Implausible?” containing compelling evidence on the measurable properties of water. As homeopathic remedies are made with water this is a critical area of investigation. Dr. E.S Rajendran presented a paper entitled “Nanopharmacology” on the presence of nanoparticles in homeopathic remedies that demonstrated another potential pathway to understanding the mechanism of action. Is one way better than another for explaining the therapeutic action of a homeopathic remedy in modern terms? With evolving research and ideas on both fronts, fundamental physical exploration and fundamental material science research are exciting. Taking into account the information from their presentations at the conference, let’s explore both of their findings to come to an understanding of the frontier in which we exist. Dr. Alex Tournier, Director at Homeopathy Research Institute, is also Director at the Water Research Lab, Heidelberg, Germany (WRL). State of the art physics is used at WRL to explore the properties of water. Tournier is certain that the answer to how homeopathy works will come from this research. Water is central to Tournier’s hypothesis. The first thing to note is that water, H2O, is not really as simple as its formula would indicate. Daily we pour it into a glass and drink it, wash in it, and use it for everything without thinking too much about it. It has peculiar properties as a material. In the solid form (ice) it floats. 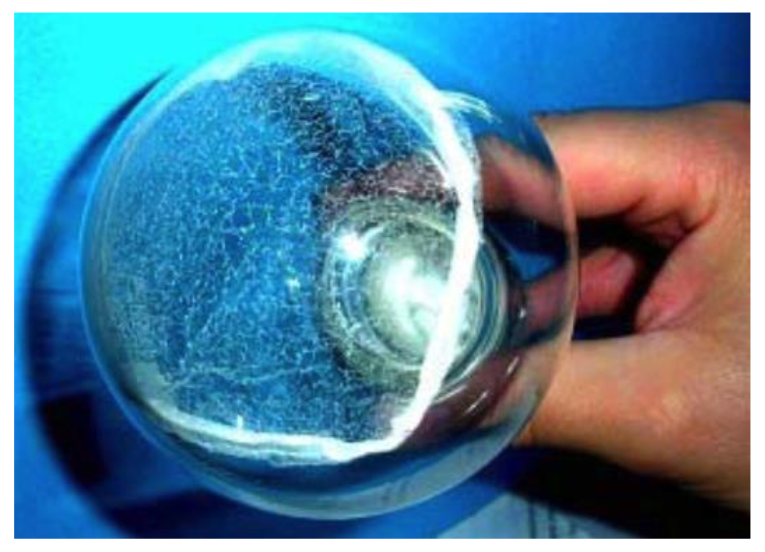 This is unusual as most solid materials are heavier and sink compared to their liquid form. Concerning the properties of water, physicists have measured 15 known phases of water. What is a phase? It can be explained as a physical structure of a material. For example, water and ice are two different phases of the same material H2O. What does this mean for water? It means there are 15 different physical arrangements of the water molecules that are consistent within themselves. Their properties are all different and measurable. They all look like clear liquid water and they all have the same chemical formula H2O. It turns out that water is not such a simple substance after all. Dr Tournier suggests the most likely measurement techniques that will reveal the mechanism of how the remedy works, will come from electrical impedance measurement techniques, spectroscopy, and Nuclear Magnetic Resonance (NMR) imaging. NMR has been able to clearly identify the structure of homeopathic remedies (made with succussion) from water dilutions (where there is no succussion in preparation). In his presentation, he acknowledged Demangeat who has undertaken studies in this area for 20 years, stated that the methodology used is rigorous, and will most likely be where homeopathy finds the scientific explanation to explain its plausibility. that the water structures are bioactive. Coherence domains or more specifically Quantum Coherence Domains (QCD) explain water-based nanostructures. Think of water in remedies as being made up, not of random H2O molecules, but specific regions of water structures. In Tournier’s view, this theory will likely explain how remedies work. These QCD’s are about the size of 25nm. The average size of a human cheek cell is roughly 60 micrometres and can be seen easily on a microscope slide under magnification. Roughly 2,500 to 3000 nanosized QCD would fit into a cheek cell. They are very small. This gives an insight into how small a nanosized region is. They are much smaller than cells and are the size of inner workings of the cell such as the nucleus, the DNA and RNA. 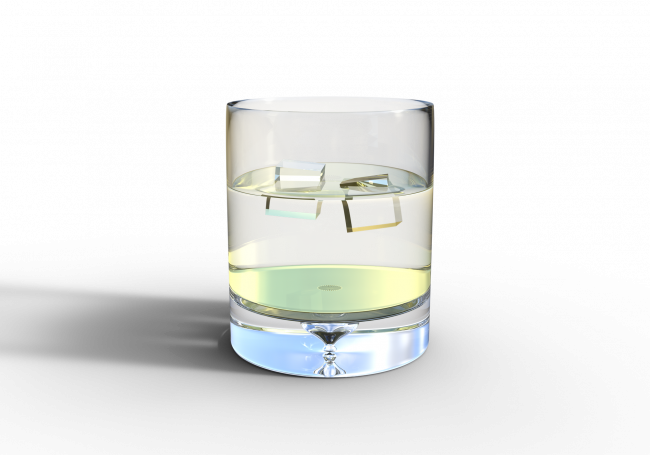 The QCD’s can hold the information from the original substance, throughout the dilution and succussion process. It interesting to see how these QCD’s could contribute to an understanding of how remedies work to support healing. They are stable at room temperature. They hold the information in an electromagnetic fashion, that is with frequency rather than due to the presence of a chemical being present. Think of it like this, say a remedy is being made from Silicon. The QCD is created through the dilution and succussion process, the QCD’s formed now have some property of Silicon. But it’s not because silicon atoms are present in the water. The property being seen is purely due to the water structure emulating silicon in some way. Experimental results in the laboratory have shown that information from a remedy will transfer to a placebo if in close proximity. The advice is to store placebo pills separately and away from potentised remedies. Tests on remedies stored next to one another show no problem. The potentised remedy seems to not transfer its information into another potentised substance. Why this occurs is not known yet. 2) Dehydrating a homeopathic remedy leaves a residue. When salt (NaCl) is dissolved in water, it was assumed that the sodium atoms all separate from the chlorine atoms and the entire structure is dissolved in the water. Research in microfluid dynamics is showing that micro clumps are formed in the water in these dissolved substances. The size of these structures is around 100nm. These clumps are stable at room temperature. The take-home message here is that – structures exist in solutions. Many different scientific investigations are showing the presence of some form of nanostructure in water, and the presence of solutes and at concentrations that would make them compatible with bio-activity. In other words, these substances will affect living biological systems like human or animal life. Dr. Tournier thinks that the best current theoretical explanation for these is offered by the Coherence Domains Theory of Preparata & Del Giudice. A lot is still to be understood and tested rigorously to confirm these frontier findings. Dr. Tournier’s presentation on these findings is continuing and it is worth watching out for his future publications through WRL and HRI to stay up to date on this exciting area of science and the properties of water. Dr Rajendran: What is homeopathy and how does it work? Dr. Rajendran also presented his findings at the conference. In a different approach to Dr. Tournier, he looked into the nature of the remedy from a material science viewpoint. Dr. Rajendran’s book, NanoDynamics (2015), outlined his initial investigations into what is in a homeopathic remedy. Is it just water? Are there still atoms of the original substance present in homeopathic medicines? Is it possible to tell? Is Avogadro’s constant (a theoretical number that explains how many atoms are present in 1 mole of material) correct or relevant to homeopathic medicines at all? He had to answer the question “what are the types of nanoparticles?” Through using HRTEM (High-Resolution Transmission Electron Microscopy), FESEM (Field Emission Scanning Electron Microscopy) and spectroscopy measurements (a way of identifying what atoms are present in a sample in a particular location) he has shown the presence of Quantum Dot (QD) material. QD’s are a defined form of nanoparticle. 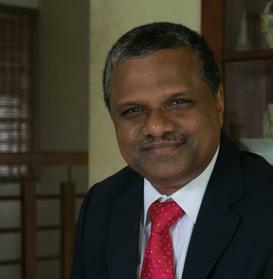 Dr. Rajendran’s investigation showed they exist in a range of organic and nonorganic remedies across a wide range of potencies (6C through to CM). HRTEM was used for non-organic material investigations and FESEM for organic material investigation. The spectroscopy results show that the QD’s do contain atoms from the parent material. For example, if the remedy tested is Aurum metallicum, atoms of gold are present in the Quantum Dots seen. It is early days in this exciting research and there are questions about the results that are raised, for example, there are contaminants and where they have come from is not clear in all cases. Two things are clearly indicated though: QD’s are present and parent atoms are also present. That is a remarkable step forward from thinking that remedies are nothing but empty water with no original atoms being present. 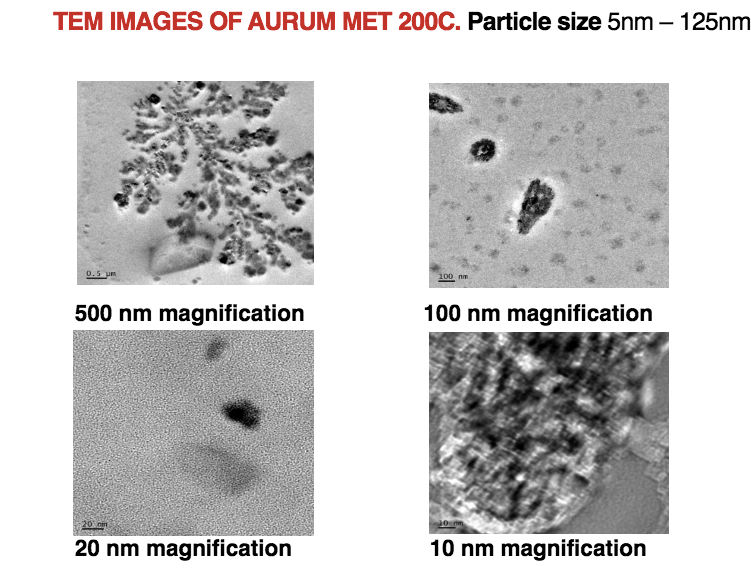 This image presented by Dr. Rajendran shows the presence of QD material in an Aurum metallicum 200C sample. In contrast to these images, the image of alcohol showed no QD material present at all. Dr. Rajendran who is a homeopathy doctor, suggests his findings show that homeopathy is not a vitalistic medicine at all. He suggested that homeopathy is nanopharmacology. He suggests that Hahnemann was speculating about a dynamic force as a way to explain the action of a remedy, but he had no way of testing this proposition. Current methods and techniques in physics and medicine show that this idea needs rethinking. Possibly into a new philosophy of homeopathy, where nanosized medicine induces epigenetic modifications to the DNA and RNA in living cells. He quotes the published work of Saha, Roy, and Khuda-Bukhsh to support this proposition. What is clear is that there are two paths evolving on this research front with differing approaches and underlying ideas. Both paths desire to understand how homeopathic remedies actually work in living systems. Both paths are striving to show why it is worth investigating homeopathy more deeply because there is something there. Plausible homeopathy exists. It is very clear that this edge we are exploring, this frontier of medical science is exciting for us all. One day it may even be the mainstream of medical understanding. Hahnemann stresses in the Organon the need to test, to explore, to examine in detail. I have no doubt that if he had the tools of today he’d be at the WRL exploring the role of water. He’d want to know why he is getting better results with water dispensed remedies. And I’ve equally no doubt he’d be exploring the world of nanopharmacology to better understand the remedies themselves and their action on the well and sick, to help tailor what remedy and potency are needed for cure. A nanoparticle is an ultrafine unit with dimensions measured in nanometres (nm; 1 nm = 10−9 metre). 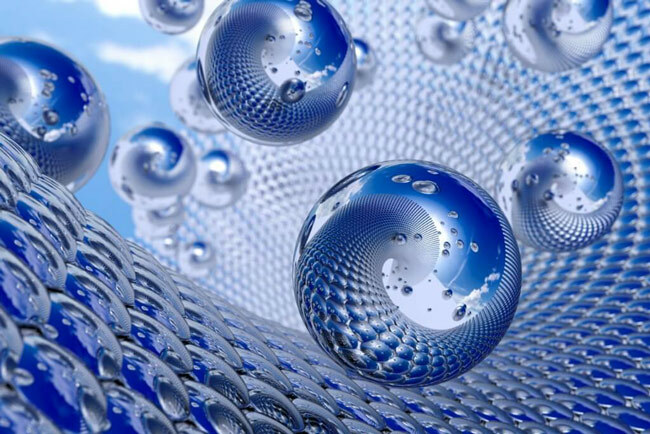 Nanoparticles exist in the natural world and are also created as a result of human activities. https://en.wikipedia.org/wiki/Homeopathy Wikipedia Homeopathy where the common view of remedies being nothing more than placebo is described in full. Geplaatst op 23 januari 2019 23 januari 2019 Auteur Jeroen WeeginkCategorieën Homeopaat Almelo, homeopaat Borne, Homeopaat De Lutte, Homeopaat Denekamp, homeopaat Duitsland, homeopaat Enschede, Homeopaat Hengelo, homeopaat Lattrop, Homeopaat Lonneker, Homeopaat Losser, homeopaat Oldenzaal, homeopaat Ootmarsum, Homeopaat Rossum, homeopaat Tilligte, homeopaat Twente, Homeopaat Weerselo, Homeopathie, Homeopathie Oldenzaal, homeopathie TwenteTags eigenschappen van water, homeopathie, kan homeopathie?